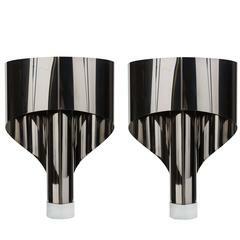 Rare table or wall light by Stilnovo. Manufactured in Italy, circa 1950s. 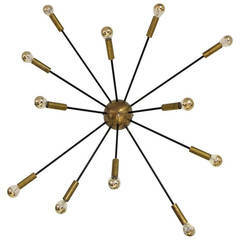 Brass base, enameled metal shade. Can be mounted on wall or used as a table lamp. Original cord. Takes one E27 60 W maximum bulb. Retains original manufacturer's label. Stilnovo table lamp model TL278 Two blue glass domes sits in metal base. Brass table lamp by Stilnovo. 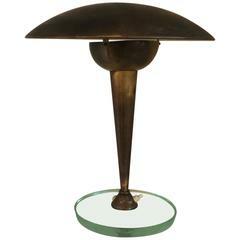 Centre brass column mounted on 3/4" beveled glass base holding an adjustable round brass shade. Beautiful brass patina. White adjustable and multi-functional desk, wall, task lamp or sconce by Stilnovo, Italy. Lamp can sit table top or be mounted on the wall. 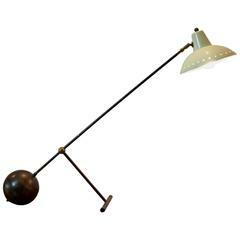 Graceful desk or table lamp by Italian manufacturer Stilnovo in the mid-1950s. Brass tube secured to round marble base pierced through round sun flower yellow enameled shade.